Over the years we've often heard the cry "I'm Bored Mum" from our bored kids. Kids need to be kept occupied or their idle hands get up to mischief. I haven't put these ideas for activities in any age order, as kids develop at different ages. Our teens will still do some things that young kids like with their younger sister, and enjoy doing it. Check all the ideas out and see which you think your bored kids will enjoy. The ideas here may inspire you. Cranium is great and there is a kids game too, it is good fun and we get some laughs from it. Pictionary is a fun game and who needs to buy the game? Get into teams and have one person write down objects or people onto strips of paper. Put these into a bowl folded up. One person from one team to take one and start drawing whats on the paper. Use a timer for a time limit. The team has to guess their own players drawing. The teams take it in turns. 2. Why not take some family time out for a few days and have a family holiday club. Fill the days with outings, crafts, cooking, games, and camping indoors or out. You could even try a themed week such as a water week. 3. Give the kids projects to do, how about building a model of your local neighborhood. All you need is a biggish piece of board, we used MDF, then draw on landscaping. Use old cardboard boxes, toilet roll middles, old cardboard tubes, foil, empty yoghurt pots etc. for the buildings. Encourage the children to be creative, Once this is all glued and dries it can be painted and then used for toy cars and people. This is also great for teaching on the geography of the local area. 4. Get a large wooden box(that washing machines are delivered in) and make a shop front. The children can make models of food to sell in the shop. You could allow them to use real tins and packet food for that sense of reality. Or how about making a cafe that sells real sandwiches and cakes(made earlier). Make some playdoh and use food colorings. The kids can have a good time making pretend food. Make sure you supply them with tools, such as rolling pins, plastic knives and forks, cookie cutters etc. Why not start a herb garden with the kids so they can grow the ingredients to make their own pizza. 7. Visit charity shops or buy a large jigsaw puzzle, challenge the kids to do it. Glue it onto a piece of board and hang on wall. 8 .Get some magazines (beg some from family and friends) let younger kids pick out pictures that they can glue onto a sheet of paper. For older kids challenge them to make a collage that shows three goals they want to accomplish n the next year. The could do a themed collage on their favorite hobby. 10. If your kids are old enough get them to set up a restaurant for you and your partner. They could create a menu, go shopping and then cook a meal for you. They can then serve it to you and clear the dishes too. Our kids really enjoy this one, it encourages them to be creative too. 11. Set up an obstacle course in your garden or indoors or do a scavenger hunt. 12. Our kids like to be involved in planning days out. What works well for us is giving the kids a variety of brochures about places we are able to visit. they can then choose an option and perhaps research it a little before the day of the outing. This gives the children something to look forward to. This works well with holidays too. 13. Have a teddy bears picnic on a carpet in the lounge or outside on a fine day. 14. Get the family photos or videos out, enjoy looking at them as a family. this is another of our favorite bored kids activities. 16. Get a roll of wallpaper. Lay it out, get the children to lie on it and draw round each of their bodies. Help them to cut their body out. Supply them with paint, glue and craft paper. The kids can then spend some time decorating their paper selves. Use cardboard and foil to make swords and shields for those who want to be warriors. 17. 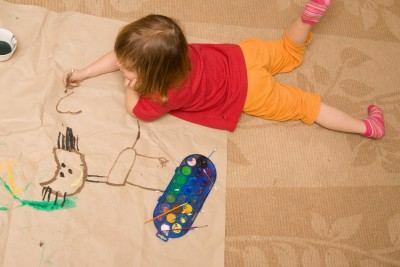 Lay a large sheet of brown paper on floor, children can paint or color big pictures on it. Kids like big. 18. Get children to write a skit or play, then act it to you or video it to show later. Our kids have had many fun afternoons doing this, it's even more fun with friends as well. 19. Bake some buns and take them to somebody who does not receive many visitors. 21. Download some of our free coloring for kids pages, encourage them to take their time coloring the pages in as well as they can. Once they have finished the coloring, scan the pictures and upload them to our kids rooms pages. Your children could also add stories if they like.